A well-fed cat is a happy one. Cats are carnivores that need a high-quality, meat-based diet to maintain their health, but how much should you feed them? While providing free access to a giant bowl of kibble might keep your cat's appetite satisfied, it could also lead to an obese kitty in the long run. How much food your adult cat requires each day is primarily based on his size. A smaller kitty will naturally require less food than a larger one, otherwise the smaller one won't stay small for very long. According to the National Research Council of the National Academies, a 5-pound adult cat requires 180 calories per day, a 10-pound cat needs 280 calories, a 15-pound cat needs 360 calories and a 20-pound cat requires 440 calories each day. These numbers are based on a domestic cat that isn't pregnant or nursing. Your adult cat's activity level can affect how many calories he requires daily. If your little furball tends to be a couch potato, he will require less food to sustain himself than a little ball of energy that bounces around your home. Cats who are shown professionally require up to 20 percent more calories than others because of the stress of the show circuit, according to the American Society for the Prevention of Cruelty to Animals. Senior kitties, those over 7 years of age, tend to be less active than their younger counterparts and also require fewer calories each day. Foods designed specifically for senior cats contain lower amounts of fats and calories, preventing obesity in older kitties. A good way to gauge if your cat is getting enough food is to follow the basic feeding directions provided by the manufacturer of your cat's food and see if your cat is maintaining a healthy weight. Increase or decrease the portion accordingly, if your cat begins to become chubby or lose weight. While your furbaby needs a certain amount of calories each day, these can't just be empty calories. Your cat's food must contain the necessary nutrients needed for him to thrive; a diet lacking these nutrients can become malnourished, even if it includes the proper amount of calories each day. Purchase foods for your cat that state on the label that they meet the nutrient profiles or feeding trials of the Association of American Feed Control Officials, recommends the U.S. Food and Drug Administration. These foods contain at least the minimum amounts of protein, fats, carbohydrates, vitamins and minerals your cat needs to maintain his health. Cats need animal-based proteins to comprise at least 26 percent of their diet and fats to comprise 9 percent of their diet, according to the nutrient profiles established by AAFCO. Both expectant and nursing mother cats need more calories and protein in their diet than other cats. Five-pound moms need 336 calories each day, 10-pound mothers need 603 calories, 15-pound mothers need 851 and 20-pound moms need 1,091 calories per day, recommends the National Research Council. When choosing foods for your little furbaby, look for those labeled "for growth," which contain at least 30 percent protein and higher amounts of the necessary vitamins and minerals your cat needs, according to the FDA. You can feed your cat canned or dry foods, depending on his tastes. According to Catster, a 6-ounce can of cat food contains approximately 250 calories, while a cup of dry cat food contains about 300 calories, either of which would satisfy a typical 8- to 10-pound cat for a day. 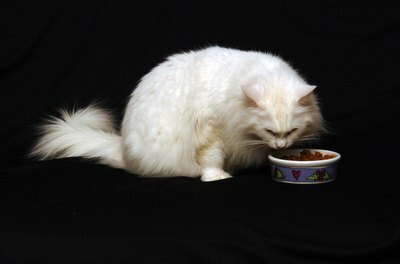 Divide your cat's portions into two meals each day or free-feed your cat with his portion of dry kibble. If you combine canned and dry food, remember to account for the calories contained in each when portioning the food. 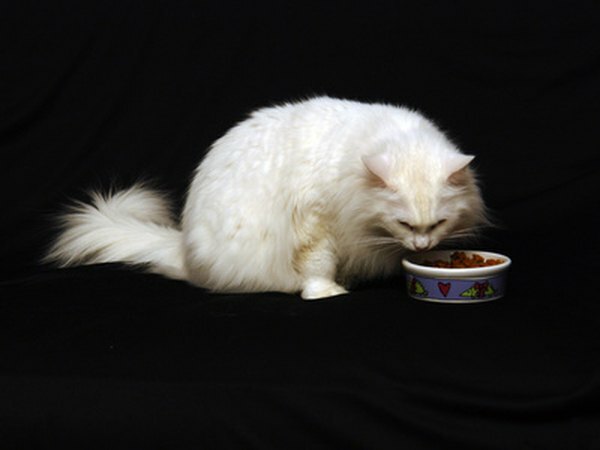 Free-feeding may be difficult in a household with multiple cats, since one cat could gobble most of the food, leaving the others with little to eat. In this case, feed your kitties at specific times of the day to ensure that each one eats only his own portion. Always provide plenty of fresh water for your cat, especially if feeding him dry kibble. Check your kitty's physique and weight regularly to determine if your little furball is becoming a larger one. If your cat has a round shape and you can't feel his ribs, your cat may be overweight. As in people, obesity in cats can cause a variety of health issues, so consult your veterinarian to determine if your kitty requires a reduced-calorie diet to shed excess weight. Special feline diet foods contain fewer calories and more fiber than others to keep your cat feeling fuller longer, without reducing his portions. If you notice that your cat suddenly begins to lose weight or you observe a change in his appetite, take your kitty to the vet for a check-up. Either an increase or decrease in appetite, with no change in your cat's activity level, could indicate a medical issue. What Size Heater Is Needed for an Aquarium? How Much Milk Does a New Puppy Need? How Much Food Should a Cat Eat Daily?